Hello everyone and welcome to another “Artist Of The Week” special. Recently I got in touch with singer – songwriter Marissa Pinto, Lead vocalist of Winters End from Sydney Australia, to do a one on one exclusive interview with Music Beats Central. Pinto reached out to MBC and sent the release of the duo’s latest single Mayfair. Truly an inspirational song as it brings awareness to domestic abuse. Marissa mentions in the interview that originally the song was not intended to be about domestic abuse, in fact the song was originally well I will let the artist tell you in this humbling interview. So much hard work, has gone into making this amazing duo with siblings Marissa and Christopher Pinto. Amazing talent indeed and can’t wait to see what’s next in store for these guys!! Please tell our readers who is Winters End? 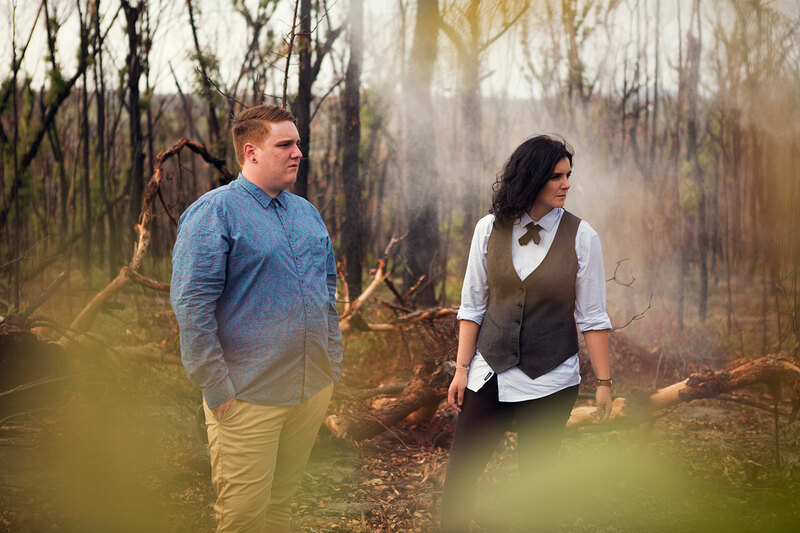 Marissa Pinto: Winters End are an indie electronic band from Sydney, Australia, comprised of siblings Marissa and Christopher Pinto. When did you guys start singing? M: I actually decided to start singing professionally when my lead singer became a stewardess and moved overseas. We had been rehearsing for months as a duo (me on keys and guitar and her singing) and I was really excited to get on stage and start performing. Her leaving prompted me to stop fearing the microphone and start singing in 2008. Christopher can sing too although he leaves the vocals with me in Winters End. Which artist or person inspired you to become an artist? M: I can’t say that any one person inspired me to become an artist, as music has always been a part of who I am, and something I knew that I wanted to explore from a young age. I do look up to a lot of artists, my heroes being Stevie Nicks, Chrissy Amphlett from The Divinyls and most recently Kevin Parker. Your latest single Mayfair is a strong and inspirational song to all women who have suffered or are suffering domestic abuse. How did the song and video come about? M: Mayfair was a song that collaboratively came to fruition. I remember taking the synth part to Christopher at the studio and he put this big tribal beat to the song, and from there it grew both in sound and lyrical content. Whilst Mayfair was not written with domestic violence in mind, we were made aware of the statistics in the recording process, and we were mortified. This is what inspired us to create the video, in a hope that awareness will be increased, and that increased reporting of incidents will occur as a result. After releasing your latest single, what reaction have you received since the release? M: Mayfair has been overwhelmingly well-received. We a lot of support from music blog reviews worldwide, and the single has been added to rotation on radio stations in Australia, USA, the UK, Japan, Germany and The Netherlands. What has been the most accomplished achievement? M: Performing internationally at Indie Week Music Festival in Canada and Youbloom Music Festival in the USA have been career highlights for us. More close to home, our first National Australian Tour which we embarked upon in late 2015 for Mayfair has been our biggest achievement to date. As an indie band, self-funding, finding time off our full-time jobs, booking shows, and radio interviews, accommodation, driving trips and flights, we are immensely proud of the tour and its success. M: We’re touring Feb 20th at The Lass O’Gowrie in Newcastle. And what would you like to say to your new and current fans? Make sure to follow the amazing journey of Winters End by clicking on all the links below and don’t forget to purchase the single now on ITunes! There are a few more of the Artist Of The Week specials, so keep a look out as my next artist will be featured here at MBC HQ very soon!!! Much love and ciao for now! MBC’s 80s & 90s Mix!! !